*Some of the links below are affiliate links, meaning at no additional cost to you, I will earn a commision if you click through and make a purchase. This mouth-watering fiery salad isn’t for the faint at heart. You need some spice tolerance to enjoy this screaming hot salad. I won’t judge if you prefer to use less spice, skip the red pepper flakes, and replace the Thai peppers with a milder pepper. Or, if you’re a heat freak, add more Thai chili peppers for a face-melting experience. This salad is not rabbit food - I would say it's much more fit for a dragon! 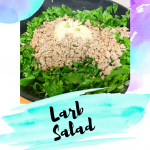 This fresh and spicy salad hits can either be a meal in itself or a perfect side with your favorite Thai Dish. Heat a pan over high heat. Add the ground pork, and break it up into small mince. Meanwhile shake the lime juice, sugar, and fish sauce in a covered mason jar. Once the meat is cooked through add the lime juice mixture to the pan, and turn off the heat. Toss all the greens in a large bowl, and add the meat mixture with the sauce on top. Sprinkle the toasted rice and red peppers over the top of the salad, and enjoy.